Our household is a family of four. Our youngest is only five months old, so even though we aren't there yet, the thought of having a third child is sometime a little crazy. The crazy doesn't come from the thought of running around after three (although that's part of the conversation) but sometimes the biggest hurdle seems to be space. Home space. Car space. In terms of home space, we don't mind the idea of doubling up kids in a room if need be, but it's these car's and the safety laws that drive us (read: me) crazy. After driving across county in our Honda CRV with the kids, there was definitely some crowding, and my wife was saying "I think we need a minivan." She's mentioned this before - not a minivan fan herself, but if there ever was a third child a 5 passenger vehicle wouldn't cut the mustard, especially with state laws that say kids up to age 8 need to sit in the back seat in a booster. Recently, I've been on a "relax the car safety" soap box. 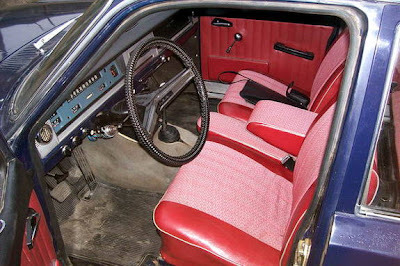 I've wanted to drive without putting my 3 year old in car seat, I've been wishing that there weren't airbags in cars, and that we drove an old car (like the picture I found, above) with a bench seat up front that can hold 3 people, we could squeeze all together in the front seat. Back in the day, a four door sedan could hold six (you could even hold seven if you put a kid on the lap) now a smaller SUV can hardly hold five. I see this is as tragedy. People talk about getting smaller more fuel efficient vehicles, but you can't really do it if you want to tote around a family with more than two kids. There's a safety and ecology conflict, and more than that, a limitation that says updated safety standards mean your family size is limited unless you bite the bullet and get a humongous tank of a vehicle. There is a definite trade off for safety.